The University of Notre Dame in Indiana has opened up a major research repository and portal to allow its community to preserve the digital assets and data from research for "decades." 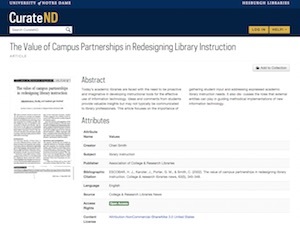 Notre Dame's project, named CurateND, was developed by the university's Hesburgh Libraries as part of a "Digital Initiatives and Scholarship" program. The repository allows users to manage "self-deposits," set up collections and profiles of work and perform other activities related to the administration of their materials, such as setting permissions for sharing and specifying embargo periods. The new system is built on Hydra, an open source repository project supported by numerous institutions, including Stanford and the University of Virginia. According to information on the CurateND site, digital assets loaded into the repository will undergo a review process to check for characteristics such as "completeness and academic integrity," to prevent submission of "junk." Once a file is added to the repository, it can't be deleted again; it can only be restricted "to nobody's use" other than the original depositor. When people leave the university, the materials remain in the Hydra system; they'll be able to access them as long as they have an ORCID, a digital identifier for researchers that links them to their research activities and output. The university said the program would evolve based on user feedback and needs. One possible enhancement could be a dashboard that reports usage statistics and citation tracking. "The development of a preservation and research tool that meets the diverse and changing needs of faculty and students has truly been a team effort thanks to interdisciplinary collaboration and input from dozens of early adopters across campus," said Rick Johnson, co-program director for the digital initiatives work. The ability to preserve data, make it discoverable and provide access privately and publicly "are major issues for all of science moving forward," added Physics Professor Michael Hildreth. "Almost every area of science is moving into a regime where there is big data to be analyzed, understood and archived. Our digital librarians have the expertise in data structures and cataloging to maximize the data sharing and archiving of large digital collections for future research." Noted John McGreevy, dean of the school's College of Arts and Letters, "Over the span of an academic career, CurateND may become a place where our scholars place drafts, completed projects and other materials so as to allow the wider world better access to their work."